Lloyd competes with ‘World Superstar’ Gareth Bale, and keeps him fairly quiet, in his testimonial game. It is fitting that the day that we gathered together to celebrate Lloyd’s long tenure at the club came when it did. Whilst the recent spate of gold medals has raised British expectations when it comes to the Olympics, the ethos of the competition is rather unique in competitive sport. Yes, it is essentially a platform to witness the peak of physical ability in a large variety of events, to bring together the world’s best in one place for a Festival of Sport; but much more than this, is it is a celebration of human endeavour, of the will to be the best that you can be. Almost every athlete seems to have a story, four years of pain and determination, all with the purpose of taking this chance to shine on the world stage. And when they have shined, when the race has been run, the pride, anguish and pure human emotion that comes with the culmination of years of hard work is worth far more than any cup or medal. Even with the unprecedented success that the British athletes have achieved, each has reacted to their various successes with a humility and grace that is rare in professional sport. Lloyd, however, is the embodiment of this side of sport. There are players more talented than him, players to whom everything comes easily. But a lot of those players are plying their trade much further down the league pyramid than Lloyd, for what they don’t possess is his determination to improve, to be the best they can possibly be. It seems that during his career, much more has been made of what Lloyd can’t do than what he can – a disservice to an exemplary defender – but this has just pushed him on to abolish those traits from his game. By the time Brendan Rodgers arrived in the summer of 2008 with his stubborn philosophy regarding how football should be played, Lloyd had already been in and out of the team. After making his debut for Luca Vialli, probably the Italian’s most positive legacy, he only played 10 games the following season under Ray Lewington before impressing the manager with his honesty and consistency; and, speaking to Rowson for his biography, Lewington’s successor Aidy Boothroyd lamented his decision to leave Lloyd out of the playoff semi final defeat to Hull – suggesting that his hunger could have made the difference. Rodgers decided that he needed all of his defenders to be comfortable on the ball (how else would they be able to play 600 meaningless two yard passes to each other every game?) and that our man did not fulfil this remit. Instead he brought in the impossibly average Gavin Hoyte on loan, with Lloyd occasionally plugging a gap at left back. Although criticism of his on-the-ball skills have always been overly harsh – perhaps due to his ungainly style – there was a conspicuous improvement in Lloyd’s ball skills from this moment on, culminating in the FA Cup tie against eventual champions Chelsea, with a glorious through ball, hit with the outside of his right foot, that swept past the static Chelsea back line and straight into the path of the mercurial Tamas Priskin. The goal was to be the highlight of Priskin’s Watford career, one which could have amounted to so much more, but was also the moment that Lloyd proved himself to Rodgers and the Watford fans. Having been out of the side, he had worked on his game and had forced his way back into the team wherever he could, making the left back spot his for the rest of the season (not that Mat Sadler offered too much as competition). Facing adversity, Lloyd did not complain; having been told he wasn’t part of the manager’s plans, he did not seek a move. Instead he kept going, and looked to himself for a solution, a sign of the true professional that is described by all that have played with him. 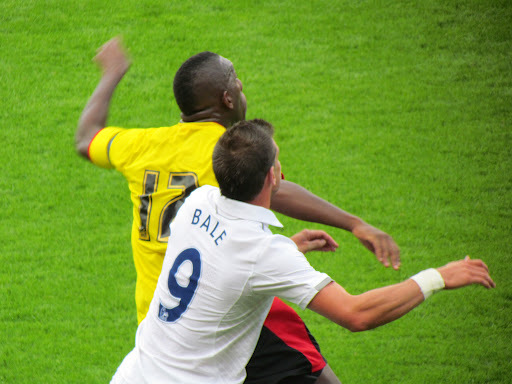 Lloyd is often labelled as ‘Mr Watford’ – a guy that bleeds yellow, that it is only conceivable to picture in a yellow shirt, with the red hart over his own. But in a way, he encapsulates the club in more ways than that. 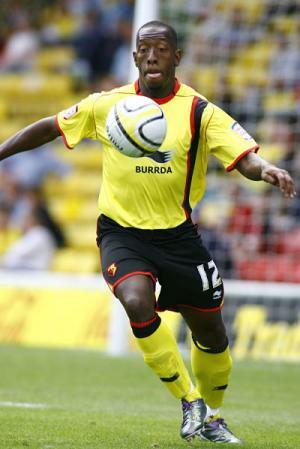 Lloyd Doyley is Watford FC in microcosm. New managers have come, and cast Lloyd aside; time and time again it has looked like his career at Vicarage Road was over, but Lloyd fights, improves and before long is back on that pitch. In the ten years he has been a professional, Watford themselves have stared into the abyss. Whilst clubs all around us have had the ground they stand on collapse and have vanished into the lower leagues – Plymouths, Bradfords, Lutons – Watford have fought on. We’ve had our future threatened by ownership issues, the crash of ITV Sport, irresponsible spending, we’ve been told that administration is months, weeks, days away, we’ve been on the brink of liquidation. But we’re still here. Like Lloyd we have kept our place against all odds, even had a brief brush with the Premier League, whilst others have fallen victim to adverse times, we have dropped the sails and rowed on mightily, reaching our calm waters, only to be faced by some other storm further down the line. And Lloyd has seen, and coped with, all of it. To be at a club professionally for ten years is incredibly special in this day and age. In today’s game, with a new manager every year, clubs being unable to pay their players scarily often, other clubs offering silly money for players to sit in their reserves, and a generally cut-throat environment regarding loyalty in both directions between players and clubs, there are a lot of people to impress and a lot of life choices that need to be made if a player is to have such a long stay at a club. The sheer volume of testimonials included in yesterday’s brochure from coaches, friends and team-mates – as well as the attendance of 9,000 at a pre-season friendly – shows that Lloyd fulfils the former criteria easily, and that he has stood firm through periods out of the first team and constant upheaval at the club suggests that he has often sided with Watford when he has perhaps had easier options elsewhere. I, unfortunately, was not there when Lloyd scored his one and only goal for Watford. I was sat at a bus stop in Camberwell, on my way – begrudgingly, I might add – to a Christmas party, when my dad phoned me. I answered to hear a cacophony of noise, ululation, of which I could make no sense. My dad is not what might be called ‘tech savvy’ and is thus not immune from the occasional mistaken phone call, so I didn’t pay it too much attention, though it was fairly obvious that we had scored. I then received a text simply saying ‘LLOYD!’ and my world turned upside down. I can’t remember too much of the subsequent night, though I’m sure I spent it regaling my uninterested university coursemates with tales of unexpected goals and a brilliant club talisman. The next day I headed not to lectures, but to my family home to watch over and over the recorded match, getting chills whenever I saw Don Cowie’s perfect volley connect so beautifully with Lloyd’s head. This story isn’t the most interesting, but the fact that everyone has a similar story, that a first half equaliser on a cold Monday night in December unites so many people, shows that Lloyd Doyley is a legend in the purest sense of the word. If nobody cared, if Lloyd had not captured the hearts of each and every Watford fan, there would not have been t-shirts, there would not have been chants in the stand, and there would not have been the most sincere of ovations yesterday as we gathered to commemorate the ten years of service that we have been given by such a humble, personable and brilliant bloke.